Your hero's health, sometimes called his HP (hitpoints), is an important thing to keep an eye on in Travian. When you send your hero on adventures or he takes part in battles your hero can lose health, and when he loses too much health he will, sadly, die (but you can revive him as you'll soon find out!). It is a good idea to know how your hero's health works, so here's a small guide on the hero health system. As you can see, my hero currently has 100% health (hooray!). As you can also see, by hovering your cursor over your hero's health you can see information about your hero's regeneration - more on that later! When you send your hero on an adventure it is possible for him to lose health. The amount of health your hero will lose on an adventure depends on the Fighting Strength of your hero, the difficulty of the adventure and how many adventures you have been on before. As time goes on adventures will become harder for your hero and he will lose more health on adventures. If you don't increase your hero's Fighting Strength and you keep on going on adventures, your hero will start to lose large amounts of health on each adventure he goes on. As for the difficulty of the adventure, an adventure can be one of two difficulties: normal or hard. On a hard adventure your hero will lose about twice as much health as he would on a normal adventure. The good thing is that he will also gain about twice as much experience as he would on a normal adventure. The two difficulties of adventures. There is one other way your hero can lose health and that is by taking part in battles. The amount of health your hero will lose in a battle depends on the total strength of the attacking and defending sides in the battle. You can't see how much health your hero lost in the report of a battle, however by calculating the percentage of troops that were on the same side as the hero that were killed in the battle, you can see approximately how much health the hero lost. For example if your hero is fighting alongside 200 Imperians in a battle and 100 of those Imperians die, that means that about 50% of your troops were lost in the battle so your hero would have lost about 50% health in that battle. Or you could just observe your hero's health before and after the battle! There are a few things to note here. The first is that your hero will die if he loses 90% or more health in a single battle. The second is that if you use your hero to attack a village, it is possible for your hero to lose health even if the defending village has no troops in it. The third and final is that no matter how much health your hero has he will always fight at full strength, with less health it just means that it is easier for him to die. So you know how your hero's health can go down, now let's learn how it can go back up! You might have noticed that some items offer your hero damage reduction. 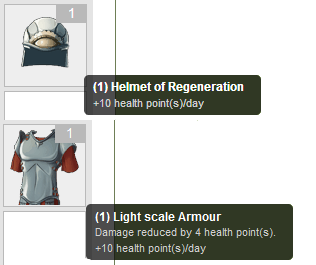 These items will help your hero lose slightly less health than he normally would while on an adventure or in a battle. The second way your hero's health can go back up is by you using an item on your hero. Ointments can be used on your hero to heal him instantly. You can obtain Ointments either as a reward from an adventure or by winning them at the auctions. Once you have Ointments you can use them by going to your hero's attributes page and scrolling down to your items. Simply click on your Ointments and enter a number of Ointments to use to heal your hero instantly. Each Ointment that you use will heal 1% health. By now you might have realised that something bad happens when your hero loses all of his health; he dies. If your hero dies that doesn't mean you've lost him forever though! What you see when your hero is dead. The amount of resources and time it will take to revive your hero depends on your tribe and the level of your hero. For a table of the revival costs/times for the hero, visit this page. One other way you can revive your hero is by using an item on your hero. The item Bucket can be used on your hero to revive him instantly. You can obtain a Bucket either as a reward from an adventure or by winning one at the auctions. Once you have a Bucket you can use it by going to your hero's attributes page and scrolling down to your items. Simply click on your Bucket and confirm that you want to use it to revive your hero instantly. A Bucket can only be used to revive your hero once, however there is no limit to the number of Buckets you can obtain. Please note that you can only revive your hero in a village with a rally point. In case you do not have a rally point in the village you try to reive your hero in, the hero will get revived in his former homw village.